3532 West Biddison Street has a Walk Score of 59 out of 100. This location is Somewhat Walkable so some errands can be accomplished on foot. This location is in the Westcliff neighborhood in Fort Worth. Nearby parks include Garvey - Rosenthal Soccer Stadium, Lupton Baseball Stadium - Texas Christian University and Lowdon Track and Field Complex. Explore how far you can travel by car, bus, bike and foot from 3532 West Biddison Street. 3532 West Biddison Street has some transit which means a few nearby public transportation options. Car sharing is available from Zipcar. 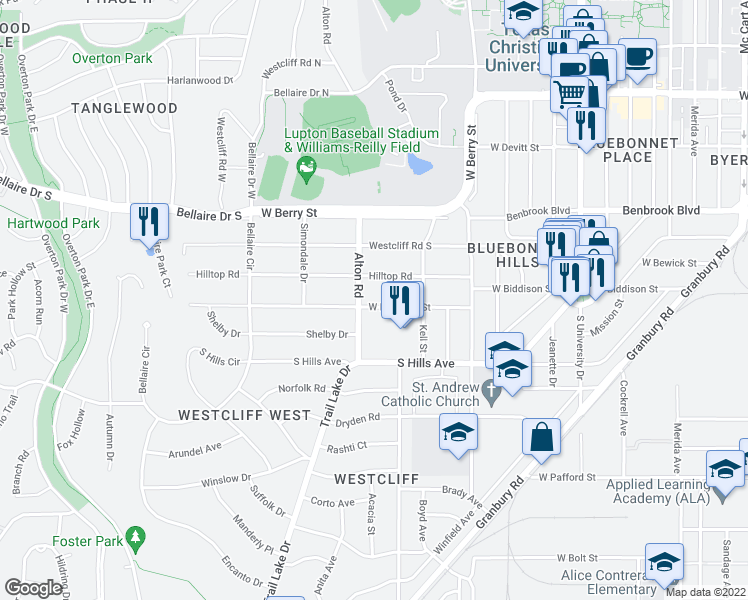 View all Westcliff apartments on a map. Stunning updated 3/2/1 within 2 blocks of TCU available for 2019 school year! Search for homes in Fort Worth or find a Fort Worth real estate agent who knows walkable neighborhoods. Links will open on our partner site Redfin.com. 3532 West Biddison Street is in the Westcliff neighborhood. Westcliff is the 53rd most walkable neighborhood in Fort Worth with a neighborhood Walk Score of 47. Moving to Fort Worth from another city? View our moving to Fort Worth guide.